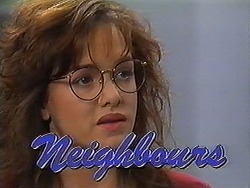 From this episode onwards there was a very short opening credits; no shots of characters were used and only the Neighbours logo appeared over a short theme tune. This carried on until 1992. The recap is now shown before the opening credits. Harold asks if Madge left the oven on, he then gets out of bed and says he thinks there's a fire. He goes into a smoke filled living room, the sofa is on fire and tries to put the fire out but the smoke is too much and he collapses blocking the front door. Chrissie drops Eddie outside number 22 to collect a few things, he races up to the front door. Madge is still in bed and is coughing. Outside, Eddie is trying to barge the door open that Harold is blocking, he calls for Chrissie and manages to open the door, and he drags Harold outside. He tells Chrissie to call for The Fire Brigade and she runs into number 24 to use the phone just as Paul comes out. Meanwhile, Madge is still in bed, she goes into the living room; Eddie is crawling along the floor and manages to help her outside onto the balcony where Harold is lying. Helen and Kerry have arrived as Chrissie announces help is on its way. 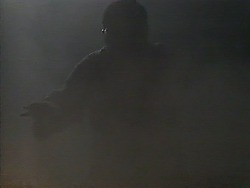 Eddie comes in and tells Helen that it seems a cigarette started the fire. Madge returns from the hospital with Kerry, she is OK but Harold has been kept in overnight because there might be some damage to his lungs and eyes. The sofa contained some toxic materials apparently. 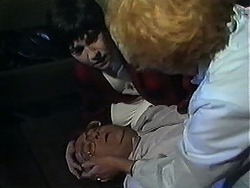 Helen says Madge can stay at hers for a while and goes to make up a bed, Kerry phones the hospital. Eddie offers to look after The Coffee Shop until Harold is better. Eddie is serving Paul; he offers to send Matt over to help him. He then talks to Chrissie, she asks if Caroline still has to pay for the damage to the computer, Paul won't change his mind about it and leaves. Todd, Cody, Josh and Melissa come in, they want to watch a horror movie marathon later, Todd and Cody were hoping to watch it alone but Melissa says she will come. Josh doesn't want to because he has a new computer game but the others persuade him. Chrissie overhears and wonders if Josh knows about computer viruses and asks him if he can help her with something. Paul is talking to the Security Guard about graffiti, he sends him away. Chrissie comes in and tells Paul can Josh can maybe fix the problem, Paul doesn't want a kid on his computer though. Todd and Cody are trying to work our how to be alone, they are hoping Josh and Melissa will be studying later but Todd says they won't be as they come in. Josh asks Chrissie about the help she needs but she says Paul won't let him, Josh is disappointed. 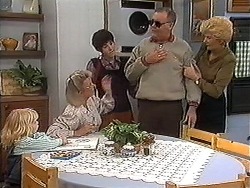 Harold returns wearing very dark sunglasses and is coughing a lot. Helen, Kerry and Madge make some jokes about his sunglasses including a few about him looking like a celebrity. Helen says that he can stay as long as he likes which pleases Harold. 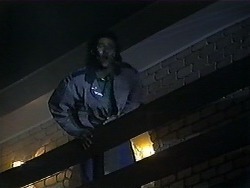 Paul returns home looking for Caroline but she is out, Paul has had a bad day, everything has gone wrong. Chrissie says he should let Josh help him with the computer but he still isn't sure, he heads for a bath. Chrissie steals Paul's keys and heads out. Josh has cancelled on watching the films, Cody wants to stop Melissa from coming also but it's too late as she arrives. Todd sits in between Cody and Melissa, he is a bit uncomfortable. Chrissie and Josh sneak in so Josh can look at the computer. Madge wants to buy Helen a new sofa but she refuses the offer. 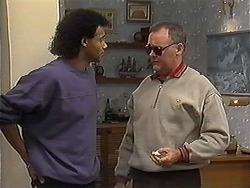 Eddie pops in and Harold thanks him for saving them. Eddie tells them about Matt helping him at The Coffee Shop which pleases Harold. Melissa gets up to get a drink, Cody is frustrated by her presence but Todd says they have to be patient. Josh says he hasn't fixed it yet so Chrissie goes out into reception to steal a magazine but outside the Security Guard spots the light and heads inside, he comes into the office and surprises Josh and Chrissie.